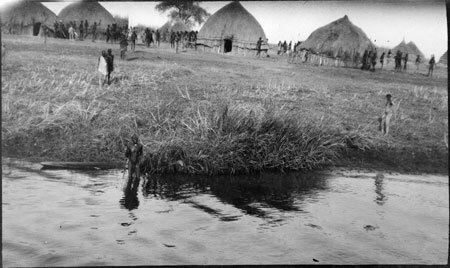 Looking from the deck of a riverboat towards the large cattle byres (luak) of a Nuer settlement on a riverbank (probably Sobat river). A number of people can be seen gathered at the settlement looking towards the boat, and there is one man in the river with a dug-out canoe. Morton, Chris. "Nuer cattle camp" Southern Sudan Project (in development). 03 Jan. 2006. Pitt Rivers Museum. <http://southernsudan.prm.ox.ac.uk/details/1998.204.5.32/>.